Sunny Knable is an award-winning composer, classical pianist, jazz player, songwriter, percussionist and educator. 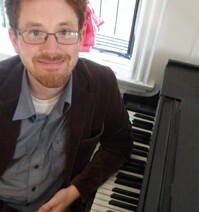 As a composer, he has won three “Best Composition” awards at the Festival of New American Music, and recently is the recipient of the Iron Composers Award (for which he wrote a 4 minute piece in 5 hours). His works have been heard in California, Florida, North Carolina, New York, Italy, China, and Hong Kong. After receiving his Bachelors of Music Degree in Composition, Piano and Jazz Studies at California State University Sacramento, he moved to New York City, where he makes his living as a pianist. He earned his Masters of Arts Degree in Music Composition at the Aaron Copland School of Music, Queens College, CUNY.